With this evening’s prayer we enter into the night of Easter. We prepare to celebrate tomorrow the resurrection of Jesus, this great mystery that we never understand completely but that can transform our lives. After the violent death of Jesus, the disciples locked themselves in out of fear. They felt this death as the end of their hope and as the failure of their commitment to follow him. They no longer saw any future. In many respects the situation of our societies is like theirs. Violence rages in the world. Wars do not end. This week there were bombings in Brussels. Europe is experiencing a growing sense of insecurity. Institutions that appeared to be a guarantee of security are proving to be powerless and vulnerable. Like the disciples, we tend to lock ourselves in, individually and also collectively, in our groups and in our countries, as if closing our doors and our borders were a solution. But I want to say emphatically: “every man for himself” is an illusory solution, a short-sighted way of looking at things. One of the situations that we have to face is the huge wave of refugees that is sweeping across Europe, and indeed in other parts of the world. Of course, fear in the face of this unprecedented situation is understandable. How to react? If I could, I would first like personally to thank all those who have shown extraordinary generosity in reaching out to migrants to help them. They show that our societies are able to live as brothers and sisters. And so we had an idea. Every week this year, we will offer a moment of encounter with young people who are coming to the aid of refugees in different countries. And during the week of August 28 to September 4, reserved for young adults between 18 and 35 years, a whole reflection will be devoted to the issue of migration. We brothers also need this sharing to keep on receiving refugees at Taizé. As Christians we do not have facile solutions to offer. But the belief that Jesus rose from the dead urges us not to let ourselves be paralyzed by fear. The Gospel recounts that the risen Christ came to the disciples “when the doors were shut.” And he said to them, “Peace be with you.” The resurrection of Jesus allows him to come to us even if our inner doors are shut. It opens a new horizon. It assures us that violence and death are not the last word. By giving his life for love, by accepting humiliation and torture, by forgiving those who hurt him, by calling God his “Father” until his last breath, Christ opened a wellspring of love at the heart of ’humanity. This spring will never run dry. And the Risen Christ gives us the Holy Spirit, who makes this wellspring of God’s life flow into each one of us. I saw at Homs in Syria, where I spent Christmas, Christians in a completely hopeless situation, hoping against hope. Humanly they see no future. Yet they say they want to continue to live together with Muslims. Their concern to protect their children, to heal their traumas, to give them a little joy touched me deeply. Let us welcome Christ tonight and tomorrow morning. He wants to rise in our hearts. With his peace he gives us the courage of mercy. Let us not be afraid! Let us open our doors, reach out to others; let us be peacemakers wherever we live. Tonight we welcomed a new brother into our community, Jeremiah, from France, Franche-Comté. He is now preparing to say a yes to Christ for life. By entering on this road he encourages us to let faith in Christ transform our lives. In our community we want first of all to be brothers, in other words each day to become brothers to one another. We live this way poorly; our community is far from perfect. But we always begin again. 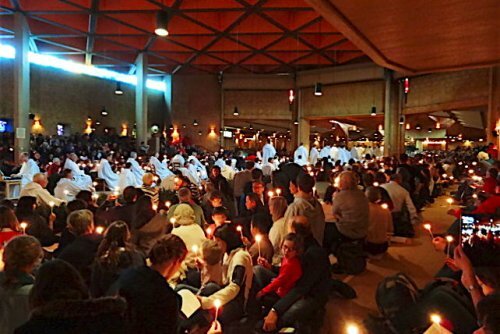 And this fraternity that we live among us, we would like to share with you who come to Taizé to find the wellsprings of the faith. To widen this fraternity we also sometimes leave Taizé. In late April, with those of you who want to join us, we will go to Bucharest to celebrate Holy Week and Easter with the Orthodox Christians of Romania. Then, in late August, we will go to Africa, to Benin, for an international young adult meeting. We would like to be more responsive to that continent, to understand the difficulties, but also to discover more the vitality of African youth. And at the end of December we will have our European meeting in Riga, Latvia. There we would like to give a clear sign. What sign? This: many young people want a renewed and united Europe, facing all the challenges of migration, a Europe which respects the identities of each country and each region, in solidarity with poor countries in the world.